3D printing has been a passion of ours for years. We use this technology for personal projects as well as for building prototypes for our clients. 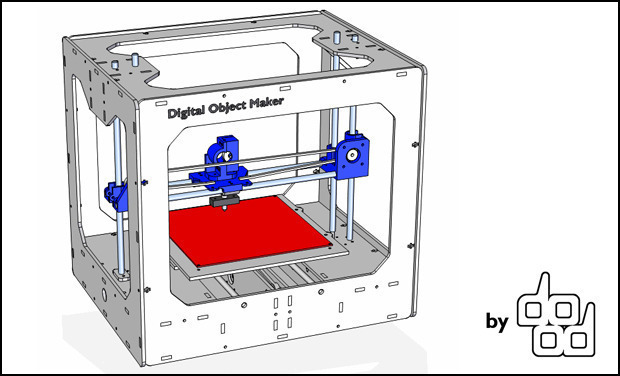 We decided to create our own 3D printer to become more independant and have access to a cheap and efficient solution. We could have assembly or order one of the many RepRap models available but we were not entirely satisfied by the mechanical part of these machines. That's why we decided to build our own 3D printer. We took our inspiration on the Prusa Mendel model. We rethank the mechanical parts and created a laser-cut structure, which is easier to assembly and give more precise results. 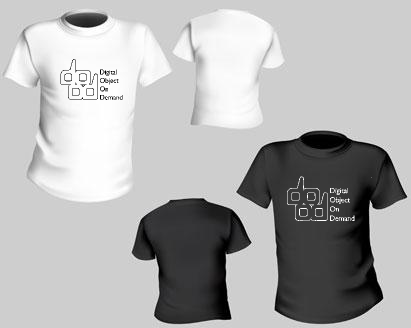 Our goal is also to be able to print in bigger sizes. After more than a year of work, we finally succeed at building a reliable machine. Our 3D printer lets you create objects from a CAD file by deposing plastic filament layer by layer. This technology lets inventors, designers, architects or makers with CAD knowledge create objects, test ergonomy or even produce small batches of a product. 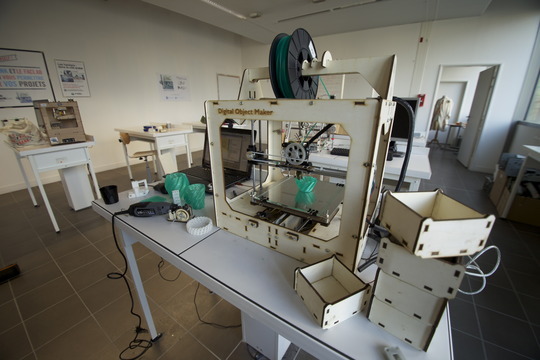 We created the DOM at FACLAB, the FabLab located in the Paris region (Gennevilliers) which gave us access to machines and tools. We also work with the students of Ecole Nationale Supérieur des Arts Et Métiers. With them, we are designing an universal extruder that will be able to accept a large variety of materials. Once the project even more advanced, we think that users could be interested by our 3D printer. The DOM will be entirely open source and all the documentation will be freely shared on the FACLAB Wiki for anyone wanting to build and improve the machine. Designing a 3D printer is not easy. It requires time and skills. That's why we also want to distribute kits that are easy to assemble in order to make our 3D printer even more accessible. We also plan on organizing workshops at FACLAB where users will learn how to build and calibrate their printer. We are also taking part of workshops organized in Lebanon and Palestine with the non-profit MedLink. Today, we have a reliable model. But we want to keep improving it. Among our goals is to build a model entirely made of aluminium that will make the printer even more precise. We also would like to continue our collaboration with the students from ENSAM for creating the Universal Extruder and find solutions for 3D printing in big size. Developing the DOM costed us about 5000€ ($6600) and a whole lot of time. Your funding help will allow us to keep developing the DOM. We work on an Universal Extruder that will be able to 3D print in ceramics, clay, sugar or chocolate. We also want to let the DOM 3D print in bigger sizes. To do this, we need to buy tools and materials. A glass 3D printed by the Digital Object Maker + rewards above.